I took this photo on the ferry crossing the Dardanelles in Turkey from Canakkale on the Asian side to the European side earlier this month. The sign simply means 'mosque', and leads to a room on the ferry for those who wish to answer the call to prayer in privacy on any of five occasions during the day. The photo symbolizes a lot about Islam in Turkey. On the one hand it is a very devout Muslim country (the call to prayer in cities and towns reverberates around you thanks to the use of loudspeakers on the minarets of mosques - it makes the Angelus seem very tame indeed). 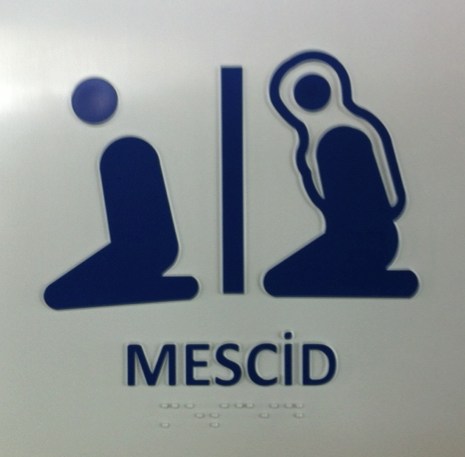 It also, obviously, symbolizes the segregation between men and women in mosques, and in Muslim societies in general. But the image also says something else: the mosque after all is on a very modern car ferry crossing one of the busiest waterways in the world. Turkey is the proverbial land of contrasts: it's European but also Asian; it's developed but also developing; it's secular but also Muslim. It was my first time in a predominantly Muslim country, though Turkey is a bit of an outlier in several regards. The thing that struck me most is that religious practice is pre-dominantly a male preserve in Turkey. During our visit to the Blue Mosque in Istanbul our guide explained that women used to pray in the galleries above the ground floor, but as there are fewer of them these days they now pray in a separate corner of the mosque on the ground floor as well. The contrast with a typical Christian church in Ireland - of any denomination - could not be more extreme: here, congregations are predominantly elderly women and some men, and younger women with children. The genius of Islam, for want of a better word, was to make men the custodians of daily religious practice, with women's involvement somewhat more optional. Christianity seems to be powering in precisely the opposite direction. Of course, Islam is not a monolithic faith any more than Christianity. As a fascinating new study from Pew Research points out, there are huge differences between Muslims around the world when it comes to the percentage who think Sharia should be the official law in their country (all o f12% in Turkey by the way, versus 99% in Afghanistan). Nevertheless, there is pressure in most Muslim countries to make official law reflect more of the core Muslim beliefs (hence the price of alcohol in Turkey thanks to taxes imposed at the behest of devout Muslims, to levels well above Dublin prices in fact). Indeed, Christians in predominantly Muslim countries are feeling increasingly vulnerable (Christians have become the most persecuted religion in the world according to none other than Angela Merkel). One result, perhaps, of the profound differences between Christianity and Islam that makes conflict as likely as cooperation. Here in Ireland there were over 49,000 Muslims in the 2011 Census, up from under 4,000 in 1991. There are now twice as many Muslims as Presbyterians in Ireland, with their numbers growing by over 50% since 2006. Though Orthodox Christian numbers grew by more than twice that rate. To the extent that Islam continues to gather and channel the support of men - and Christianity the support of women - then I can't help but be more confident (in the probabilistic sense) of a successful future for Islam. Though it may not be so great for women. t emphasizes the proximity between religion and daily life. Life, from an Islamic standpoint, is to be directed to Allah. Life is an opportunity for worship and the remembrance of Allah.